Co-promoters Bob Arum and Eddie Hearn staged a press conference today (Tuesday, Jan. 15) at London’s elegant Landmark Hotel to announce that Terence Crawford will defend his WBO welterweight title on April 20 against Amir Khan. The timing was rather odd as the venue is unsettled -- Madison Square Garden and the MGM Grand are the frontrunners – but as Arum would likely tell you, it’s never too early to marinate the hype. The bout will mark ESPN’s initial foray into the world of solo event pay-per-view. Khan was outpointed but that didn’t diminish his stature. “Britain has lost its tether over him,” wrote Mark Whicker in the Orange County Register who noted that the Khan-Kindelan match was shown on the big screen at Trafalgar Square under a sign that read Amir-zing. Khan went on to defeat Kindelan twice in amateur bouts before turning pro amidst great fanfare in July of 2005. Two years later, almost to the day, he climbed off the deck to wrest the British Empire lightweight title from Scotland’s Willie Limond. Needless to say, Khan, who is of Pakistani descent, has had his ups and downs since that moment. The first thud came in September of 2008 in Manchester when Columbia’s unheralded Breidis Prescott (who by the way has lost seven of his last eight) knocked him out in the first round. Khan was knocked down hard 30 seconds into the fight and it was all over in 54 seconds. Khan rebounded nicely. He won the WBA 140-pound title with a 76-second blowout of Dmitriy Salita and defended it four times before losing the belt on a controversial decision to Lamont Peterson. But since the Peterson fight he has been stopped twice, first by Danny Garcia and then Canelo Alvarez. The Kahn-Canelo fight, contested at the catchweight of 155 pounds, was the first boxing event at Las Vegas’ T-Mobile Arena. And it played out as many expected with Khan having his moments before he was betrayed by a soft beard. Canelo, the bigger man although both came in at the same weight, lowered the boom in round six with a devastating right hand, a classic one-punch knockout that left Khan on the canvas for several minutes before he was removed to a hospital as a precaution. Khan took 23 months off after this setback and during this hiatus he became even more famous in England. 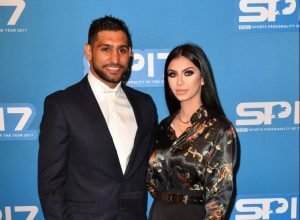 He hired a publicist who booked him on the TV show “I’m a Celebrity, Get Me out of Here,” a British version of the TV show “Survivor,” and fed the tabloids and gossip magazines a steady stream of folderol regarding Amir’s supposedly tempestuous relationship with his attractive Brooklyn-born wife, the former Faryal Makhdoom. Khan’s conservative Muslim parents were horrified by Faryal’s westernized ways and both accused the other of infidelity. They toned it down when Faryal became pregnant with their second child, a daughter born in April of last year. That same month, Khan returned to the ring with a 33-second knockout of Toronto’s overmatched Phil Lo Greco. In September he took on another Toronto-based fighter, Samuel Vargas, against whom he won a wide 12-round decision. Those wins pumped up his record to 33-4 (20). Unlike Amir Khan, it’s doubtful that Terence Crawford will ever transcend his sport, but you don’t have to sell Crawford (34-0, 25 KOs) to knowledgeable boxing fans who recognize that he is something special, arguably the best pound-for-pound fighter in the sport today. Right on. Does anyone NOT think Crawford has his arse with ease? I'm not entirely sure (I would say that ) Khan has “transcended” boxing, including for reasons that relate to him “starring” on “I'm a celebrity get me out of here”. He has that Olympic pedigree, fast hands, and has been in some very good fights. The fight with Maidana was great. But, then, there are those defensive liabilities. And, they often come back to haunt you; Samuel Vargas, Danny Garcia, Sual Alvarez, and Breidis Prescott. They’re the same defensive liabilities that (for owning the antithesis of) Mayweather used to take heat for. It’s unlikely Matthew will (meaningfully) fix these/his defensive liabilities now, and as such . . . .
Crawford will hurt/beat him; if not stop him. However, if Khan could fix his defensive liabilities (and, it should be noted that anxiety is one of them) and take his time and set his shots/punches up, then . . .
Khan could possibly be one of the best welterweights out there right now. If I were Khan, I would probably look to train/spar with Spence (and vice versa) for this fight. The mere presence of both Khan and Spence’s opponents (and their styles/stances) means they both need each other. When is Beterbiev fighting next? Beating a shopworn Kell Brook? Maybe. Competing with an inexperienced Errol Spence? Possible. Upsetting elite P4P star Terence Crawford? Never happen.